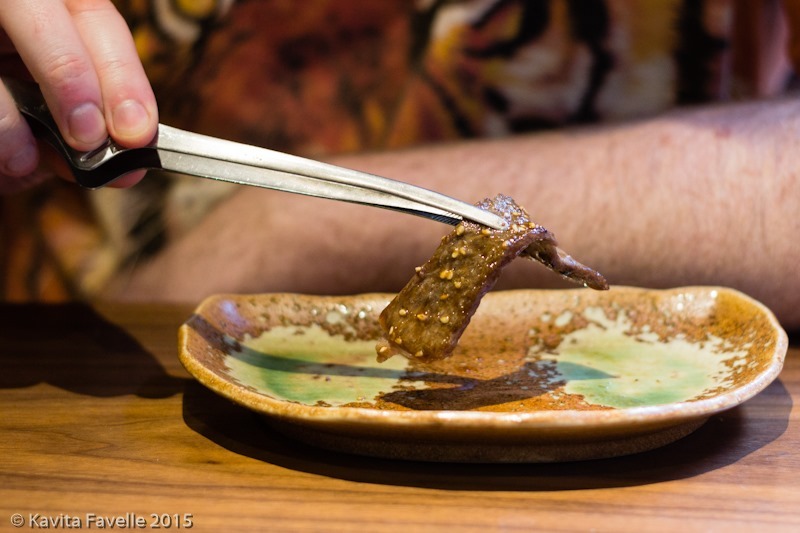 Pete and really loved yakiniku dining during our two visits to Japan; I have written previously about our yakiniku experiences, along with the history of yakiniku. 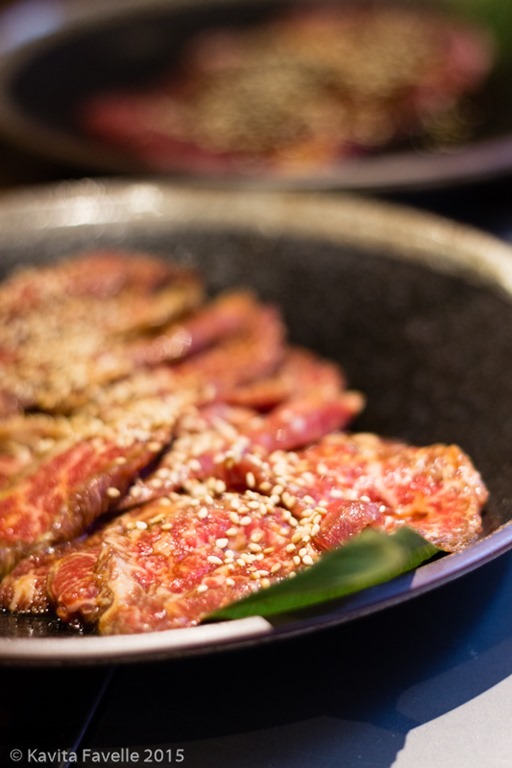 Considered a Korean import, the Japanese version is no longer an exact copycat of its Korean inspiration, not least in the range of meat cuts and marinades and the selection of side dishes. While there are plenty of restaurants offering Korean BBQ in London, Kintan may well be the first yakiniku restaurant, as it claims. 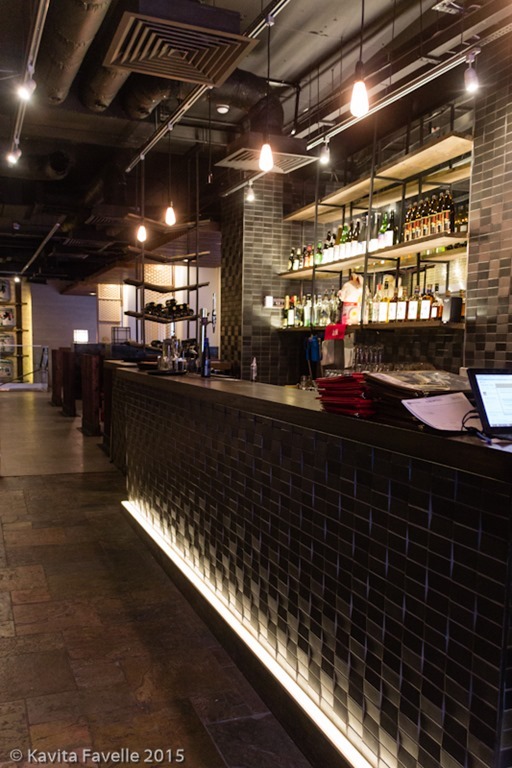 Brought to London by a company that is successful across Japan as well as in Hong Kong and Jakarta, Kintan boasts a prime location on High Holborn, and was doing brisk business on the January weekday we visited for lunch. The interior is very attractive, simple but with beautiful details. I particularly loved the various tiles used on different walls around the deceptively spacious interior, and also the beautiful wooden booths, tables and area dividers. There are touches of tradition in the sake barrels and smiling Asahi maneki-neko (beckoning cat) but it’s essentially a modern style. 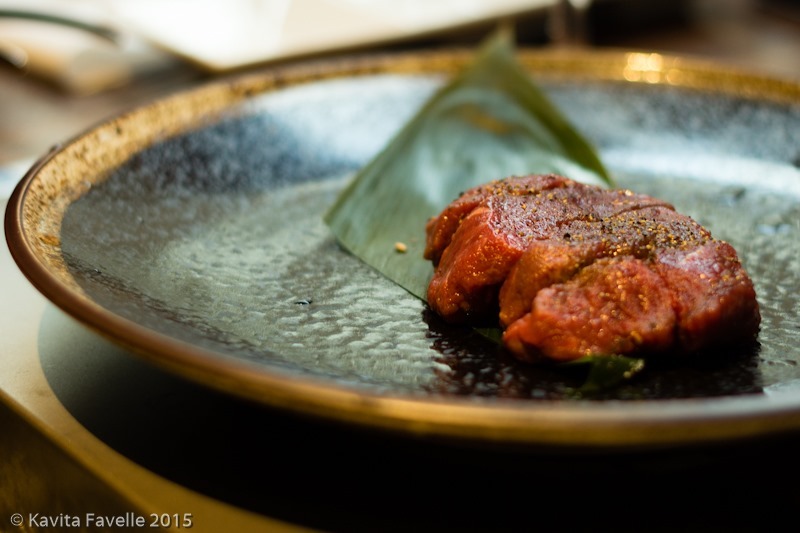 We were invited to try the Premium dinner menu, £44.50 per person. There are other dinner options at lower and higher price points, plus some very reasonable lunch deals (£8 to £18 for yakiniku, less for non-grill options) to appeal to the office workers in the area. We started with a sparkling sake, a brand that’s stocked by quite a few Japanese restaurants here. 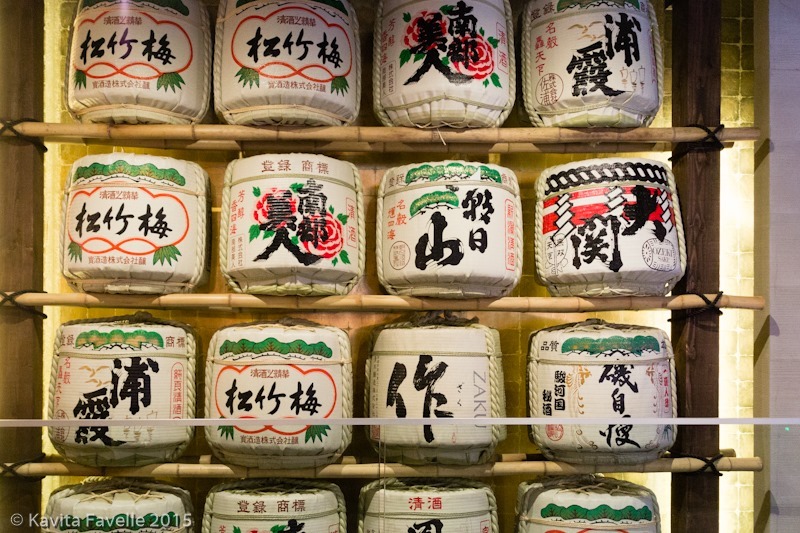 It has the distinctive flavour of sake but is lighter in alcohol, sweeter and with bubbles. 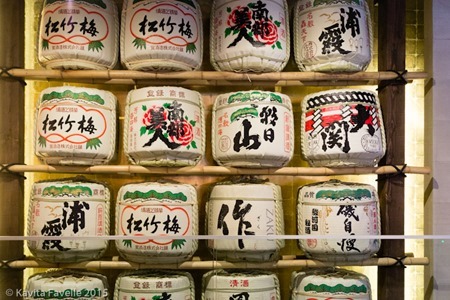 A friend called it the babycham of the sake world, a spot on analogy! 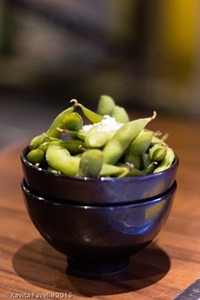 First to be served were the Kintan salad and edamame beans with salt. The beans were… well, edamame beans. 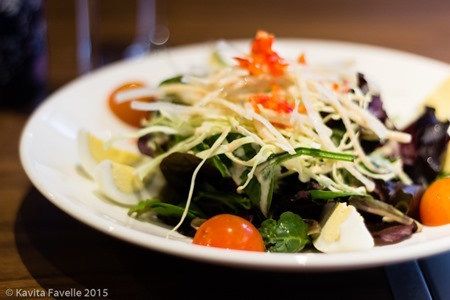 The salad was delightful, light crunch from raw shredded cabbage, mixed salad leaves, cherry tomato and hard boiled egg all dressed in a light but richly flavoured mayo. Hot oil seared salmon was super, with blanched ginger matchsticks and a light sesame oil citrus dressing. 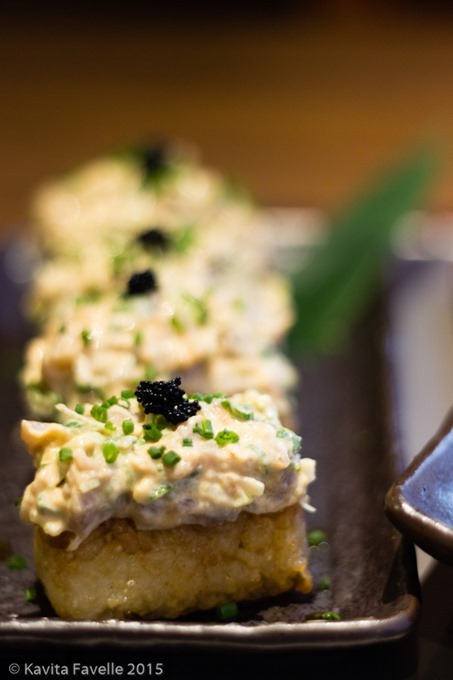 Tuna tartar volcano was a highlight – a light tuna mayo with spring onions, chives and caviar on a crunchy deep-fried block of rice that was both crispy and chewy and a gentle kick of heat too. A real winner! There were seven dishes listed under “Mains” for the Premium dinner menu. We were served only five, though I didn’t realise until we’d left (when I took another look at the photo I took of the menu). On one hand, we certainly had plenty to eat, and enjoyed everything we were served; but on the other, a failure to deliver two out of seven dishes seems quite an oversight and one I’d be crosser about had I not been invited as a guest. A fourth plate of (skirt) beef may not have been a big deal but the lack of halloumi, when I remembered it, was such a shame – I adore barbecued halloumi! 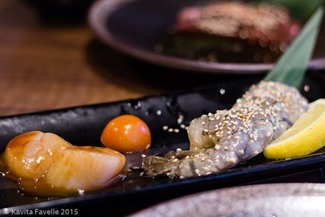 Most guests will look at the menu to order but can hardly be expected to memorise dishes, so it’s important for restaurants to serve all that is ordered (and charged for). 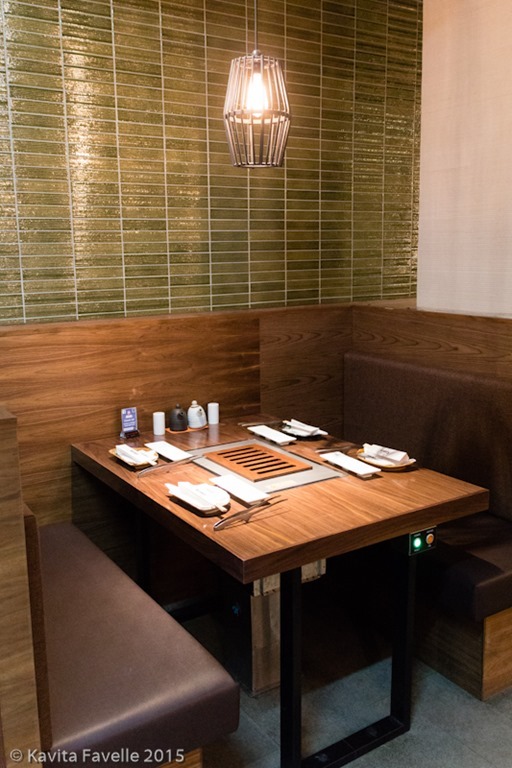 Unlike the yakiniku restaurants we tried in Japan, at Kintan the grill is recessed below table level but that’s a good safety feature and we liked it. It did have the clever Japanese smokeless extraction system that whips away smoke before it rises above grill level, meaning you shouldn’t walk out smelling like a bonfire! 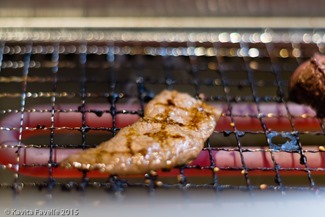 Be warned, the grill radiates a phenomenal amount of heat and you’ll certainly feel hot sitting around it. Perfect for winter but probably less appealing in the heat of summer. 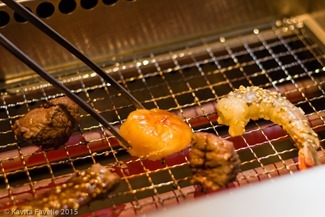 What really surprised us was how long it took for the grill to heat up enough to cook our meat. Even after the elements started glowing red, it took much longer than expected to get even the hint of a sizzle when we placed a slice of beef onto the grill. Once it finally got to temperature, everything was good with the world. We loved the three different meats that were served – salt and pepper fillet, premium rib eye and premium kalbi short rib, the latter two in different sticky marinades, the fillet with an accompanying yuzu ponzu dipping sauce. There were also two delicious dipping sauces on the table. The prawns were tasty too but the scallops were pitiful. I wondered, from the waiter’s instructions to make sure we cooked them very thoroughly for at least two minutes on each side, whether they’d been frozen and then defrosted but he assured me not. From the texture and lack of taste of the scallops, I remain unconvinced. A pity, when the beef was so enjoyable. 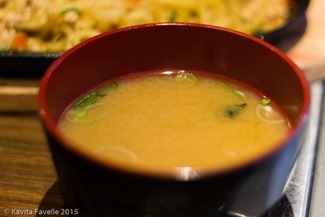 Our miso soup came near the end, as we’d requested when asked earlier on in the meal. 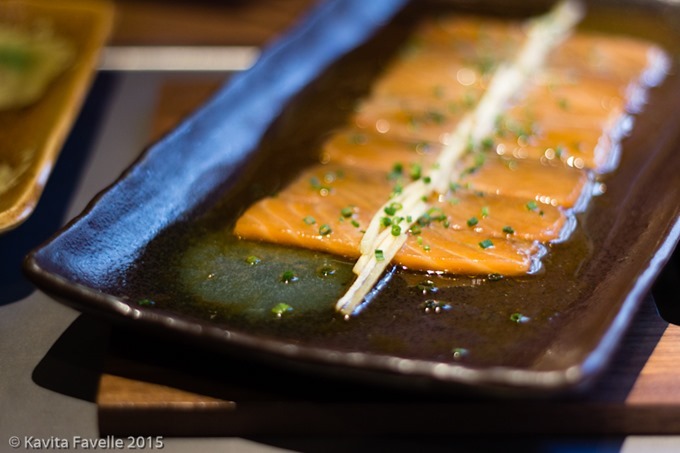 It’s listed as a starter, but more commonly enjoyed at the end of a meal in Japan, and I prefer it that way. 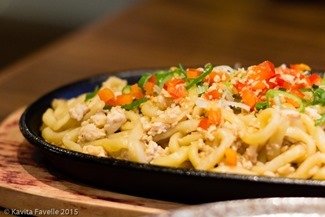 Also delivered quite late, when we’d nearly finished the meat and seafood, were garlic fried noodles. Also listed as a starter, I’d have preferred these to come out at the same time as the proteins were served. They were very tasty, but I must give you Pete’s description which sounds odd but is exactly right – they tasted just like garlic bread! And yet were chewy, like udon noodles! So strange, but rather good, regardless. I wondered if they were made in house, but our waiter thought not; he said that the company is quite a large one and most of their sauces and many ingredients are supplied by the chain. 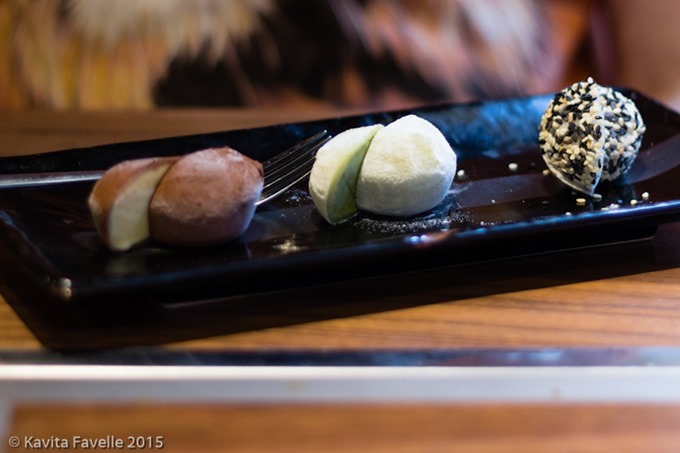 Mochi ice creams to finish were lovely. The salted caramel was Pete’s favourite but too sweet for me; I loved the matcha and sesame flavours. At £90 for two, plus drinks and service, this is not a cheap dinner, somewhat at odds with the situation in Japan where we found yakiniku prices if not quite low budget, certainly very affordable. Some of that will be down to the central London (Holborn) location, but I suspect it’s also a case of charging what people will pay for an unfamiliar experience. We had a good meal (albeit missing two dishes on our set menu) but I can’t help comparing the price to several Korean BBQ dinners we’ve enjoyed at our local Yijo restaurant in Central Finchley; we’ve been hard-pressed to spend more than £25 a head there and eaten at least as much as we did at Kintan. Of course, Yijo and Kintan are not exactly like for like – while the grill meats are very similar the non-grill dishes at Yijo are firmly Korean with lots of kimchi, pickles and spice; at Kintan it’s more of a modern Japanese mix. If you’ve not tried yakiniku, this is a a good place to try and the lunch deals seem to offer a great value option. Kavey Eats dined as guests of Kintan restaurant. 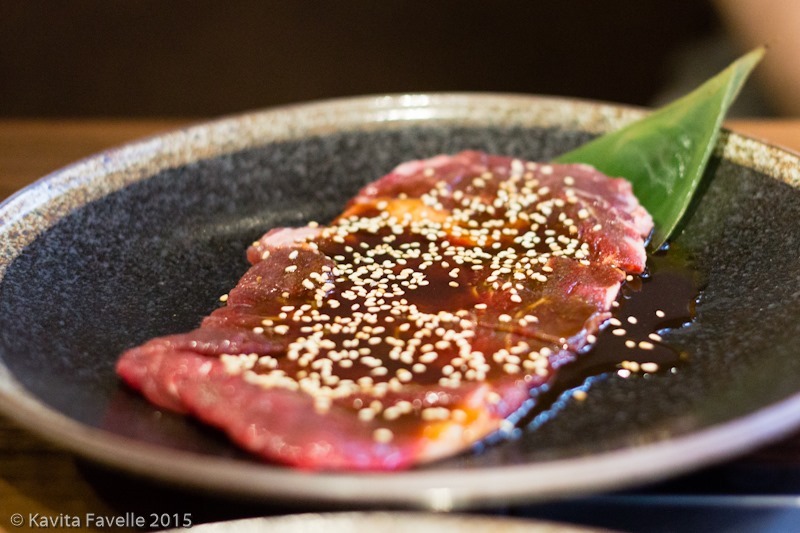 16 Comments to "Kintan Restaurant | Yakiniku in London"
Interesting review – we were invited there recently too, and also had quite mixed feelings about it. Nothing so bad, but just didn’t set my world on fire. 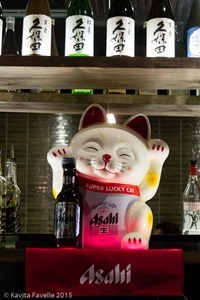 That is THE best description of the sparkling sake – I didn’t like it, and now you’ve called it baby cham, that’s exactly why! Way too sweet, and also unexpected!! Very interested in your thoughts, Rosie. We liked most of what we were served, but felt it was expensive, given what one can find in London. 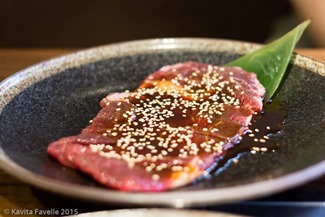 Of course, it’s unfair to compare prices in Holborn with those of my local Zone 3/4 Korean BBQ place… and yet I do because, like many Londoners, price is an issue. I don’t mind paying more when there’s nowhere else to get a similar experience for less and it’s an experience I want. But when I can experience similar for less, it’s harder to justify. Yes, I am glad someone else has that thought about how one’s clothes smell after some meals! The menu we had was expensive but also very extensive. For lunch there are a lot of very reasonable sets available, which are good value. Interesting review. I often reflect on outings afterwards, like your missed dishes and the price, and it leaves a later (excuse the pun) bad taste in my mouth. I often think “oh that would’ve been awesome.. Had it been half the price.” Please you enjoyed it at the time anyway. Sarah, that’s why I mentioned the two missing dishes in the review, that was a serious issue and I think worthy of highlighting. What we were served was mostly very enjoyable (scallops excepted) and there are certainly less expensive options available, especially at lunch. But yes, still pricy when compared to other not dissimilar offerings. My Korean boss’s reaction to the review was Let’s try this place! So we’ll be booking to go when she’s next in the country, and can pause for breath. That’s cool! 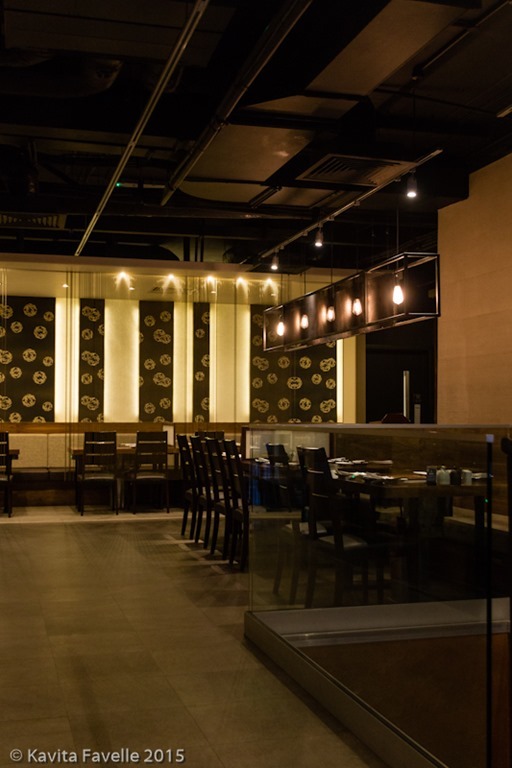 Though if she really wants great and very authentic Korean in London and is willing to take a 20 minute tube trip, Yijo next to Central Finchley station is utterly awesome. Also much cheaper and really RIGHT next to the tube station. Thank you Camilla, the food was photogenic as well as tasty! 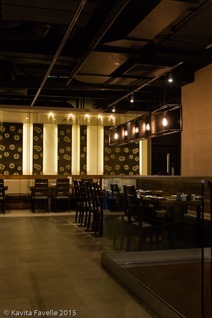 This place looks great Kavey… I really would love to try it as I’m a recent convert to Japanese cuisine. 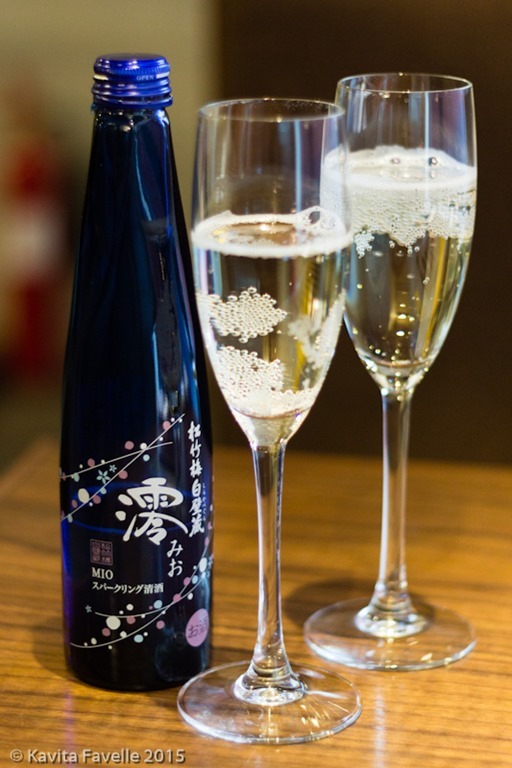 Sparkling Sake… now there’s a drink i’d love a glass of!!!! I have a sweet tooth so the sparkling sake is a favourite, but it’s not supersweet line dessert wines. Hope you are able to visit soon. Interesting Kavey, having enjoyed Korean BBQ for a fraction of that price I would be reluctant to spend so much money although I do love the look of some of the fish dishes you were served. 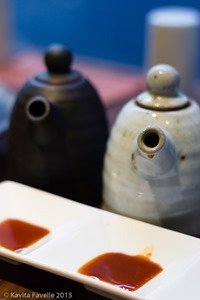 I have also tried sparkling sake and think it’s delicious when served with the correct type of dish although I have much more of a soft spot for the chilled sakes. Yes it is very pricy, even when the location factored in! I love many of the chilled sakes too. Looks and sounds pretty good but the missing items is a real shame. Yes a huge shame, especially for that price.